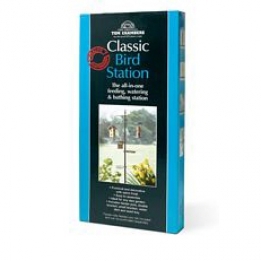 Classic Bird Feed Station - Simply Bird Garden Birds Supplies. This classic bird feed station consists of a 3 part pole, spiral double armed bracket, single bracket, integral feed dish and water dish. Simple assembly, push in the ground and hang bird treats or feeders from the hooks.High quality the best and most fashionable online of the replica watches store. Sure to attract a wide range of birds to your garden. Keep the dish filled with water.